Has mining company American Manganese indeed developed a less energy- and water-intensive way to produce manganese? Kachan report examines if so, and other implications for clean mining worldwide. Mining has traditionally been a dirty business. But that’s changing. Kachan & Co., a cleantech research and consulting firm, has published a report examining the clean mining claims of mine developer American Manganese (TSX.V: AMY; Pink Sheets: AMYZF; Frankfurt: 2AM). The company is developing a manganese deposit in Arizona and aiming to become the lowest cost producer of the metal, which is used in lithium ion and other batteries, as well as other cleantech products, and in the manufacture of steel. Currently there are no other North American providers of manganese. Key to the company’s lowest cost ambitions is a new hydrometallurgical system to process the ore. The company claims its process uses far less energy and water than existing ones, and results in tailings (i.e. the output of the process) that are environmentally benign and may be placed back into the site immediately after processing. In a departure from conventional mining and processing techniques, American Manganese’ process is intended to be a virtually closed loop, with water recycling and extraction of toxins. There are to be no unsightly tailing ponds or standing produced water onsite. “Mining has traditionally been a largely dirty business. But that’s changing. American Manganese’s site in the desert of Artillery Peak, Arizona is to look very different from the images of the oil sands of Northern Alberta, for instance, or where hydraulic fracturing (“fracking”) is performed for natural gas,” said Kachan. Kachan’s report on American Manganese examines supply and demand for the electrolytic manganese metal (EMM) the company plans to produce, and describes the company’s hydrometallurgical process and what sets it apart from today’s approaches. It then summarizes industry feedback from interviews with mining professionals worldwide and concludes with its own analysis of American Manganese’s probability for success. 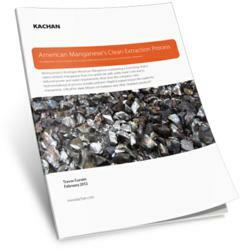 Kachan & Co.’s report titled American Manganese’s Clean Extraction Process is available for immediate download at http://www.kachan.com/research/american-manganese-clean-mining-process. The report is intended for companies in the global manganese and steel industry value chains, mining firms seeking to develop their own clean or green processes, battery technology vendors of lithium ion or other advanced chemistries, governments and others.